I've had a busy AGU Meeting. The week has passed as a blur of meandering through the maze of posters, dropping into and out of oral presentation sessions, and plenty of bumping into people whom I've known over the years. In this post I'll highlight some of the things I found interesting. As I reported last time, I presented a poster about FMARS on Monday. I'm happy to report that it went very well, and I struck up some good conversations with people about the analog Mars research project. The question I got asked the most was how we tracked traffic on our website or followers in social media. My answer was that we didn't but will next time. My poster was next to one from the Exploratorium on their Ice Stories project, which I have been following with great interest for the past year. I spent the afternoon cruising posters and talks. One very popular poster was titled "OMG, Earthquake!" and was about the USGS Twitter Earthquake Detector. It even had a press conference that resulted in some media attention. I finished the day listening to some interesting talks about Hubble Space Telescope observations of the July 2009 impact into Jupiter. Monday evening I had the pleasure of viewing two special talks. First was the Whipple Lecture given by Jean-Pierre Bibring on "Mars exploration: bridging our past and future." 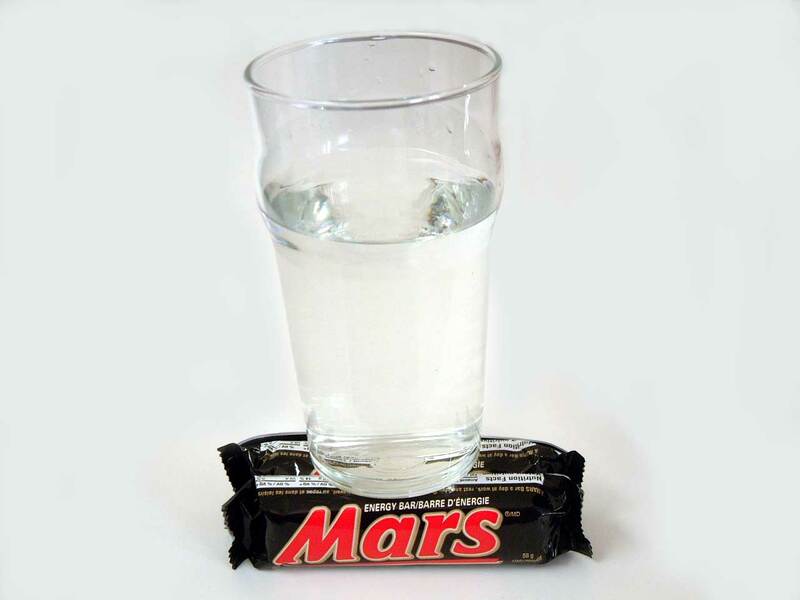 It was all about how the OMEGA instrument on the Mars Express orbiter has revolutionized our thinking about the history of liquid water and possibly of life on Mars. In a nutshell, liquid water on Mars could only have existed while Mars still had a magnetic field that helped the planet retain an atmosphere. Once the dynamo shut down at the end of the "phyllosian" era 4.2 billion years ago, most of the atmosphere escaped, making it impossible for standing water to persist at the surface due to the low pressure. Bibring also tied this to studying the origin of life on Earth and said if we're going to look for evidence of past life on Mars, we should go to the areas rich in phyllosilicates in the southern highlands. You can read more in Bibring et al. 's 2006 Science paper. Then I attended the annual "Frontiers of Geophysics Lecture" by the new USGS Director Marcia McNutt. She highlighted a number of societally relevant basic research projects going on at the USGS. The AGU blog and planetwater blog had nice posts summarizing the key points of her talk. I rounded out the evening hanging out with fourteen other geotweeps at the #geotweetup gathering. You can see a photo of us on TwitPic. Tuesday was the big tsunami day at AGU. It started with a press conference on the 2009 Samoan tsunami. I've blogged previously about the Samoan tsunami and what it's like working at a tsunami warning center. Throughout the day there were many posters and talks about the event. The magnitude 8.0 earthquake was very interesting to geophysicists because it is a normal-faulting outer rise event. That means it's not due to compressional slippage between the plates like most great subduction zone earthquakes. Instead, it is due to tensional failure of the plate as it bends in the region known as the outer rise. Outer rise seismicity at the Tonga subduction zone is a topic I know very well because I spent three years studying it for my master's degree at WashU. Some of the presentations from tsunami field survey teams featured quotes, photos, and videos from interviews with local people affected by the tsunami. One survivor said the waves were like a "dark beast jumping out of the sea", and another said it sounded "like war and machine guns." I skipped lunch to watch a special screening of NOVA's Hubble's Amazing Rescue. It showed how the astronauts of mission STS-125 trained for and carried out Servicing Mission 4 to the space telescope. You can watch the show online too. I wanted to also watch AGU's screening of TARA: Journey to the Heart of the Climate Machine, but it didn't work out in my schedule. I attended several planetary science sessions on the Moon, Mars, and Mercury too. This included a morning oral session about the LRO and LCROSS impact results, an interesting poster showcasing a new global composite map of Mercury, posters on radar mapping of Mars, and an oral session about the MESSENGER mission results to date. One of the Moon talks was about how the radiation environment there is tolerable for human explorers. In addition, there was an exciting oral session co-sponsored by Google about virtual globes that you can watch on the archived video from the session webcast. I'll have more to say on this topic tomorrow because that's when the first hands-on virtual globes poster session will be. The full program of "Virtual Globes at AGU" is available online. Tuesday night was the joint Northwestern - Washington University reception. The annual event is held at AGU for alumni and friends of the Earth & Planetary Science Departments at both universities. The two departments are similar in many ways, and over the years there has been a lot of cross breeding between them. As it turns out, I happen to be one of the small club of people who had the pleasure of attending both schools as a student. Several of the Northwestern folks complimented the recent Northwestern Magazine article about me. Afterward, I went out to dinner with some friends from Washington University. The big themes for me today were astrobiology and virtual globes, with a healthy dose of other topics sprinkled in as well. I started the morning at the Sagan Lecture titled "Life at the Common Denominator: Mechanistic and Quantitative Biology for the Earth and Space Sciences" by Tori Hoehler. A gifted communicator like the lecture's namesake, Hoehler cited Schrödinger's little-known book What is Life? as inspiration for his approach to searching for life. In our search for life in the universe, he said we must go back to the fundamental physics relating the energy requirements for life rather than allowing our terrestrial biases to influence us. 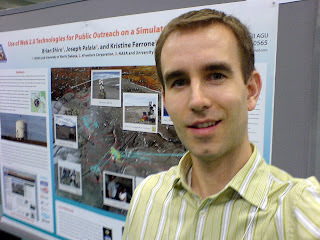 The AGU Blog had a nice post summarizing the leture. Later in the day, I ducked into a fascinating session on Astrobiology and Society. The talks I saw were towards the end of the session, and they dealt with the relationship of astrobiology to religion and public opinion on the origin and evolution of life. This is a topic the Vatican has recently considered as well. The speakers essentially gave an overview of the subjects presented in the book Exploring the Origin, Extent, and Future of Life. One thought-provoking talk by a bioethicist raised questions relating to the ethical observations human have to extraterrestrial life and whether we have an obligation to help spread life throughout the universe. He argued that from Judeo-Christian point of view, humanity is a steward of the environment and life, which would include the idea of protecting and fostering life on other worlds. Lunch was provided by AGU. I was one of about 30 people to attend the first AGU Geobloggers Lunch. We had a good time getting to know each other and each took turns introducing our blogs to the group. Most of the blogs represented at the lunch are on the AGU Blog Roll. 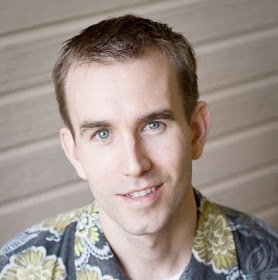 The blogs ranged from personal to professional and everything in between. Dan MacKenzie over at Who Hung the Moon? had a very nice writeup about the event. He even complimented this blog. I perused posters in the afternoon on topics ranging from seismology to Venus. However, I was most impressed by the interactive Virtual Globes session. "Virtual Globe" is a fancy term for a computer-generated planet that lets you explore geographic data in 3D. The most famous virtual globe is Google Earth, although NASA World Wind and others are great too. One poster by Yamagishi highlighted a very interesting capability he and others at JAMSTEC developed to easily plot seismic and other geophysical data in Google Earth. Declan De Paor has also developed some great capabilities in Google Earth to showcase geophysical information. For example, you can visualize subduction zones and volcanos in a lab he developed here. I wrapped up Wednesday by attending the Birch Lecture titled "A Eulogy for Eustasy" by Jerry Mitrovica. The talk was about how long-term sea level changes are likely going to be greater than we thought (up to 8 meters) because sea level was higher during the last interglacial period than initial research suggested. This means polar ice is more vulnerable to warming. Mitrovica said that melting ice sheets produce non-uniform sea level changes in the oceans (not according to the theory of eustasy) because one has to take into account the gravitational attraction of the [former] glacier. The net effect is actually a lowering of sea level in the region nearest to the melting because there is no longer a large body (the ice sheet) to gravitationally attract water in the region. If the west Antarctic ice sheet melted, sea level would rise 7-8 meters in North America and its antipode in the Indian Ocean, but sea level would fall a little in Europe and the south Pacific. Both models and observations from the last interglacial period support this idea. Mitrovica also said that it's possible to melt something as big as the west Antarctic ice sheet in as little as 200 years. As luck would have it, I bumped into the same USGS person who helped train me to use the Geonics equipment for my electromagnetic experiment at FMARS. We sat down today and looked at the data my crewmates and I collected in the field on Devon Island. Since we were in such a highly resistive environment and only had 40-meter loops, the data do not show much evidence of subsurface structure. However, we're confident that we'll at least be able to constrain the bulk resistivity properties beneath the surface of FMARS. Stay tuned for more on that by next the LPSC meeting next March. There were lots of great poster sessions ranging from icy satellites in the outer solar system to natural hazards here on Earth. I got a free T-shirt from Google MapMaker at the final virtual globes session. MapMaker is a new service that allows you to correct and expand maps in places where they don't exist, particularly in developing countries. I spent the evening at the Exploratorium for AGU's public lecture on "Near Earth Comets and Asteroids - Finding Them Before They Find Us." The lecture was given by Don Yeomans of NASA's Near Earth Object Program Office. Having just taken a course on a related subject at UND, I found the lecture to be too general, but it was captivating nevertheless. Afterward, there was a reception and a live webcast with scientists at the South Pole. I was impressed by how clear the video feed was. 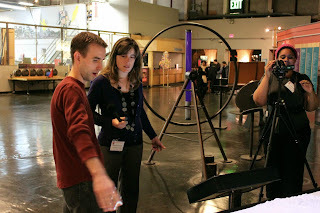 It was fun walking around the interactive science exhibits, but I didn't have much time for play. 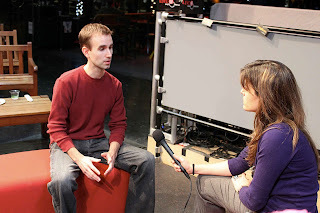 Instead, I was interviewed on camera for AGU's Younger Scientists' Video Profiles project. The program aims to produce a series of short 3-minute videos of scientists doing cool things. It's mostly for K-12 students but will also be released on YouTube. My attention span nearly maxed out, all I could do today was listen to a few talks on a planned sample return Mars rover and a planned mission to visit multiple asteroid systems comprised of 2 or more asteroids orbiting each other. I walked around the strangely uncrowded poster hall and struck up some interesting conversations with people about antipodal seismology and outer rise earthquakes. At lunchtime, I called it a day. After I finish writing this blog post, I plan to go for a run in the beautiful sunny San Francisco weather. Tomorrow I'll head back to Hawaii. NPR's Science Friday featured AGU today on it's program too, so you can learn more by listening to the podcast, once it gets posted.